This is a cake I had made a few days back when I was asked to make a proper cake with a lot of icing. Yes, my husband is a sucker for filled or iced cakes. Considering the layers of creamy icing I’d have to slather onto the cake, I decided to bake a cake which in itself isn’t heavy at all. This chiffon cake I think is perfect for a thick icing, since it’s not heavy on its own whatsoever. Also spongy, airy and light, and in fact tastes like one of those store bought cakes which we usually get to eat at kids birthday parties. However this was all fresh, nothing store brought except the ingredients. 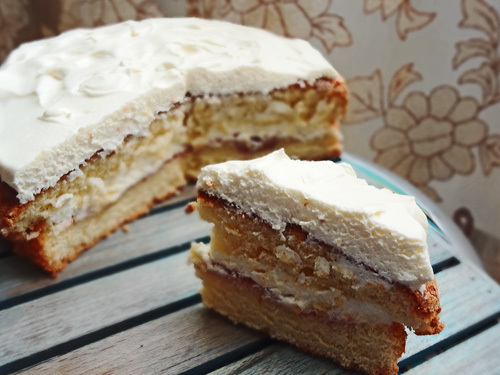 The other good thing about this cake is that it only needs a very few ingredients. One can make a fairly large cake out of it too and it’s perfect for gatherings. I have no step by step pictures this time, but it’s so easy really. This is it. These are all the ingredients. No need for any baking powder, butter, nothing. It;s a very light cake. Okay, first we have to divide the sugar into three parts. Sift 50 gms sugar with the flour,and keep aside. 50 gms sugar for the egg yolks, and the rest 70 gms if for the egg whites, so keep aside. Starting with the egg yolks first. Beat the sugar and the egg yolks till they take on a pale yellow hue. I had to beat mine for about 15 minutes- I was using a hand mixer. You can by all means use whatever you feel necessary. Once you have reached that stage wherein the sugar and eggs are completely mixed and pale eggy yellow, mix in the vanilla and beat until its all incorporated. Into this mixture sieve in the flour and sugar and keep aside. Don’ mix anything right now. Now we start beating the egg whites. Beat until they form soft white peaks. This is the time we start adding in the sugar, a teaspoon at a time. This is to ensure that the sugar is completely incorporated and that there aren’t any undissolved sugar crystal. The beating has to be vigorous. Beat until all the sugar has been mixed, the eggs are shining white in fact a bit matte by now, and forming stiff peaks when you lift your beater. For the final folding of the batter. Take 1/3rd of the egg white mixture and gently fold in with the flour and egg yolk mixture. You have to ensure that you fold it well, instead of mixing like a maniac, because it’s the folding that ensures a very risen cake. When the batter gets well mixed, fold in the remaining egg whites. The Chiffon cake batter will look very very pale yellow, in fact sort of creamy, like the wall pain on my kitchen. I used a springform pan. It was easy to just take off the sides, but really, use whatever shaped mold you like. Bake at 160℃ for 45-50 minutes. The cake will rise to extraordinary proportions. It was a joy to just watch it rise every minute. Let the cake cool before you slather the icing. You can either bake the cake into 2 molds, or be lazy like me and bake into one and divide it into two by using a clumsy hand and a serrated knife.